THE RIGHT CAUSE IN THE RIGHT PLACE AT THE RIGHT TIME. What an amazing year for food! On every level - from local to global - the issue of hunger relief and sustainable agriculture are integrally tied together. As food policy decisions play out, Sustainable Food Center holds fast in our mission to cultivate a healthy community by strengthening the local food system and improving access to nutritious, affordable food. Change occurs through policy advocacy as well as grass-roots community organizing, and SFC has been at the forefront of both this year. School Gardens Keep on Growing! 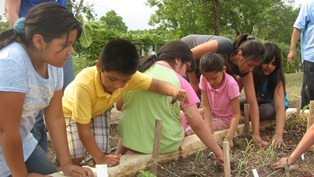 Did you know that SFC’s Grow Local program has provided assistance to more than 130 school gardens in the Austin area? These gardens can be found at public schools and private schools, from preschools to high schools and every level in between. Click here to read more about SFC's work in Austin schools! The Happy Kitchen/La Cocina Alegre® (THK) Program Director, Joy Casnovsky, had the opportunity to travel to San Francisco for the annual American Public Health Conference, the largest conference of its kind in the US. With over 12,500 people in attendance, there was a little public health for everyone. Click here to read more about the exciting events the conference! 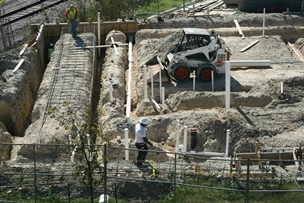 Please bookmark our campaign page to view our construction updates. Click here to read about how Austin Food Blogger Alliance is helping SFC tell our story through their generous donation of time and talent this quarter! In the last few months you may have seen a few new faces at the Taste Tents and the Information Booths at the SFC Farmers’ Markets. The lovely ladies of The Junior League of Austin have arrived! Last year, The Junior League of Austin (JLA) voted for SFC as one of the volunteer placements. And this year we’re reaping the benefits of these wonderful folks. Click here to read more about our wonderful JLA volunteers! Congratulations to Quinn Goodloe on winning two tickets to the Eat Drink Local Week Urban Farm Bike Tour, presented by Edible Austin and Bicycle Sports Shop! Book reservations NOW for Dec. 1-8 for Contigo, Congress, Hillside Farmacy, Hoover's or dozens of other locally-sourcing restaurants! SFC is proud to partner with many community groups, individuals, and foundations to strengthen our local food system and cultivate a healthy community. Among our valued partners is the AstraZeneca HealthCare Foundation's Connections for Cardiovascular Health℠ program... Click here to read more! edie bird, a local green cleaning product business has partnered with SFC to donate 10% of online sales from Sept through Nov 2012!